As VR headsets like the Oculus Rift are expected to roll-out for sale to the general public in early 2016, the ways in which headset users can immerse themselves into new VR experiences are still expanding. As the video shows, a (lucky?) VR user is strapped into a seat atop a platform that is suspended in a large room - that is in turn attached to a series of motorized pulleys. The the computers and pulleys take over. Apparently convincing your body that you are swooping through space is a lot easier if you're actually swooping through space. Based on robotic platforms for performing maintenance on large sale projects - like huge airplanes, the device in the video above was built by Professor Heinrich Bülthoff and colleagues at the Max Planck Institute for Biological Cybernetics. According to a September 28th, 2015 post to radiotovr.com Dr. Bülthoff's "CableBOT is comprised of a central ‘cockpit’ frame, complete with chair, harness, modified Oculus Rift DK2 and computer to power it. 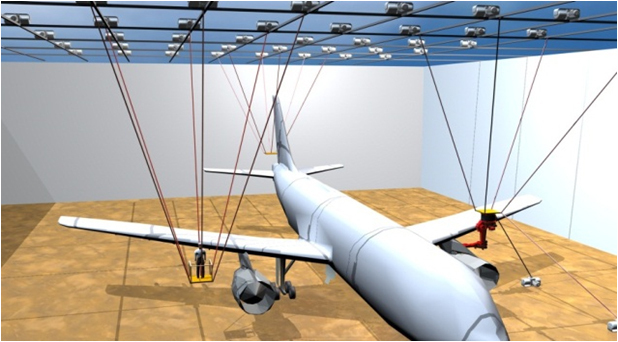 The central cockpit is attached to a series of motorised winches which are coordinated to apply or release tension to and from the cockpit in such a way as to allow elevation, descent and rotation of the platform – giving a full six degrees of freedom for movement (6DoF)." Thanks to transmedia author and consultant Michel Reilhac for the link to CableBOT article in radiotovr.com. Hello!. Here I watch time in different cities of the world. https://current-time.world/Egypt/Cairo/Cairo I recommend to look, I think you will be interested.